Best Abs On BodySpace: Learn Their Six-Pack Secrets! Many of the world's best bodies can be found on BodySpace, the home base for some spectacular amateurs. Check out these abs! As the world's largest social media site for the fit-minded, BodySpace is a kaleidoscope of amazing bodies and stunning features. Virtually every one of those bodies is judged at first glance by its midsection. If the belly is soft, no need to look any further. But if it's so ripped you can hear the wind blow through the crevices, time to check out the rest of the body. So, without further delay, check out some of the best abs BodySpace has to offer! Dana is one badass athlete. She joined the gym to get some QT with her (now) husband. She used it to sculpt some of the most complete abdominal domains in the universe. The two of them built flagnorfail.com. Dana's sample workout is rigorous but doable. Check it. For more about Dana, go to her website (danalinn.com), Facebook, Twitter and even YouTube! She is everywhere! "Each time I go to gym (4-to-5 times per week) I do 20-to-40 minutes of ab exercises. I also try to change my workout habits every 2 to 3 weeks," says Olivier. "A variation of ab exercises is important to work every part of your abs. One exercise should never become a habit.."
"I do at least a couple sets of abs every time I work out, often between sets or at the end of a workout. If you want results, you need work these muscles often. Your core has so much potential and takes consistent effort to transform!" 1 set to to burning (about 15-30 reps) Place hands on hamstrings to assist with sit-up motion. 1 set of 10 reps Sit up fully and reach throw to touch your feet. Find more about Michelle on Facebook, or get her book After Baby ABS! on her website (buffmother.com) or on Amazon. Josef works as an online trainer, but here he shares a simple sample ab workout to get you started. He also has a complete ab program on his website. He has Twitter and Facebook pages for networking with friends and clients. All of his exercises are done with minimal rest periods. "I've never used any specific ab routine, but this sample workout is great for strengthening the core!," says Laura. "Yes, compound exercises like deadlifts strengthen your midsection! Be consistent with exercise along with eating right and you'll have great abs." She adds: "My best tip on abs is to clean up your diet! The longer a person consistently eliminates junk food, alcohol, and other crap, the more defined their abs will be!" For more of Laura, check blitz her social media on Facebook or check out her website! 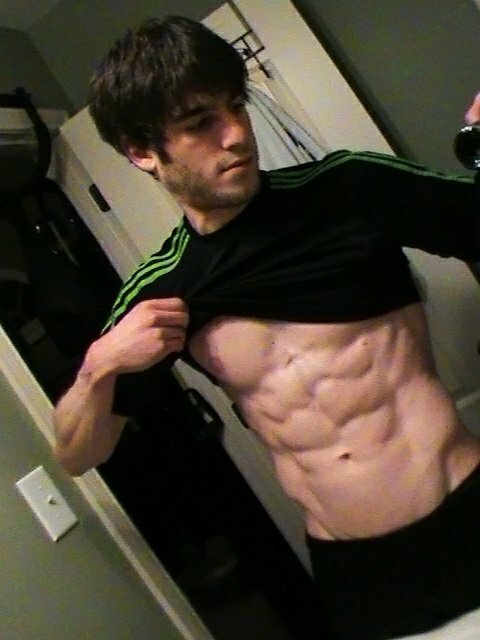 Mike earned those wicked abs after his friends coerced him into the gym back in 2009. He's made incredible strides in a short time span. Wanna match his washboard? Get started with his favorite exercise, hanging leg raises. He starts and ends this circuit with it! For more on Mike and his progress, check out his Facebook page! According to the Swiss Miss, working on overall muscle growth stimulation is far more important than specific abs training. She concentrates squats, deadlifts, bench presses, shoulder presses and rows/chins. These exercises stimulate overall muscle growth and in turn develop your abs! Aim for 150% of your bodyweight for 20 reps in the squats and 175% of your bodyweight for 20 reps in the deadlift and you will get stronger and more fully developed abdominal muscles than you ever could by racking up hours on the crunch mat! NOTE: Don't use a belt on these exercises. It'll rob your abdominal structure of some amazing stimulus brought through the balancing of your trunk. Once you reach strength targets, begin to train the abdominal section more specifically. You must still use resistance; this is what muscle responds to. Whether it's arms, legs or abs, muscle development requires resistance training, not endless reps. I squeeze my abs, keep my knees together (this ensures focus upon my abs and not my hip flexors) and use my maximum range of motion. After that I do knee-up-style training on a low bench to target my lower abdominals-again, very controlled. If you're a beginner, do what I did to get here, NOT what I do right now! Stick with major lifts to become stronger throughout your body before adding specific training that targets your abs. Consistency is the key. Train hard and increase the resistance in small increments at every opportunity. Follow these rules and you'll be on track to a body (and abs) that you never believed possible. Then, if you really want your newly developed abs to show, work as smart in the kitchen as you do in the gym! For more on this Swiss star, check out her Facebook page! 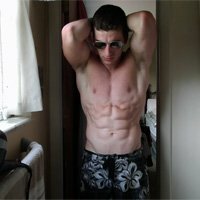 According to Rick, "I don't do floor exercises with bodyweight for abs. I believe they should be trained like any other muscle, so I train them with weight and hanging resistance. I also train obliques and lower back hard, because if any part of your core is weak, it brings down the whole thing. "Always train your core, not just when cutting. When on a bulk, you try to increase lean mass, so why not continue to train your core so you have something there to uncover?" For more of this Tattered Saint, check out his Facebook Page! According to Kate, "I do 3 complete rotating sets moving from exercise to exercise! I start with the ball planks because it hits the deep transverses ab muscles and gets them all nice and warmed up! I then hit the windshield wipers, because they are harder than the other abs lifts included in this routine. "Hanging leg raises finish burning out my lower abs. I start with straight legs. Then, as it gets harder, I continue with bent knee-ups. The Bosu ab crunch/weighted ball throw to ceiling works my upper abs. I do as many crunches with the ball throw I can, and then drop the ball and finish burning them out with basic crunches, hands behind head. "This killer ab routine gives me awesome results for a full core workout and the shaping of my abs!" For more on Katie, check out her Facebook page! "The main tool I use for working my abs is a set of arm straps attached to a pull-up bar," says Eric. "The bar mounts easily on a door frame. This is a convenient, inexpensive and effective way to achieve a productive ab workout at home." Says Eric: "These ab strap options allow me to work every portion of my abdominal muscles. I like to change the bend in my legs, speed of repetitions, and angle of my back, occasionally switching halfway through a set. As I advanced, I started wearing ankle weights or holding a dumbbell between my feet. By switching between leg raises and knee raises, alternating one leg at a time, and twisting from side to side, hanging ab straps are capable of working my entire core." For more on Eric, befriend him on Facebook!